In Spring 2011, youth from Enterprise High School’s Friday Night Live Chapter, studied the issue of underage drinking in the Enterprise area. In March, they completed assessments of six local businesses that hold off-sale liquor licenses. 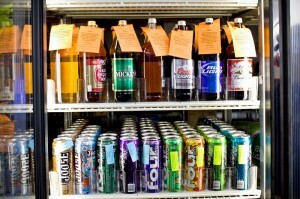 Alcohol displayed in the lower portion of coolers (at the eye-level of young children). Advertisements for alcoholic beverages at or below the mid-line of coolers (at the eye-level of young children). The youth believe if the stores were willing to voluntarily change those items listed above that pertain to their store, the stores would be helping to make a statement that the community supports the youth in their efforts to make alcohol less attractive to teens. Certainly, it is only when we all work together that we can change youths’ attitudes about alcohol. After the youth released their findings to the businesses they were able to go back to one business and conduct a “Sticker Shock” Campaign. 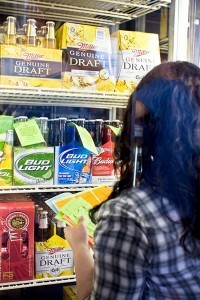 Youth placed bottle hangers and stickers on alcoholic products in the store. Prevention facts about underage drinking and consequences of providing alcohol to minors were printed on the bottle hangers and stickers. The bottle hangers were placed on one bottle in a six-pack of beer or on a single bottle of alcohol. The stickers were printed on bright paper and were placed on the side of each case of beer.